@audeonic Can I use MFXConvert with music apps to page through their presets ie next preset, previous preset using a midi controller and the app to convert to from midi to PC message? If so can you put a screenshot up of how this would be setup in MFXConvert? Would it be possible to have mfxConvert default its converted value to the "learned" value? e.g. I learn note 60; when I select the event type I'm converting to (say continuous controller) it currently defaults to 0 (even if I already assigned 0). Ideally it would default to CC60 (or whatever the learned value was). This way setting up a bunch of conversions would be quicker than scrolling the number list. HOLY CRAP - these are gonna melt my world. Faders for harmonies, Imagine this with SpaceCraft! MBV pitch swells ! <Spacecraft again! Great the bundle out would like to see more videos on each apps use before I took the plunge not sure what use I’d get out of each app and unsure to be honest how half of them work or get set up. Many thanks, going to bite! 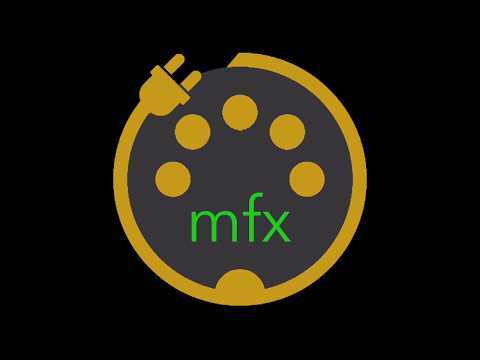 mfx Series is a set of compact and powerful MIDI plugins. They can each be used as an Apple Audio Unit (AU) MIDI effect or as a standalone app connected via CoreMIDI virtual ports. Instead, I does horrible things with downloading images and previews. Can't we get rid of this? Seems okay to me... What was it doing? @Michael This is strange, I only pasted the URL and the forum loaded some seconds longs and changed it into a preview.